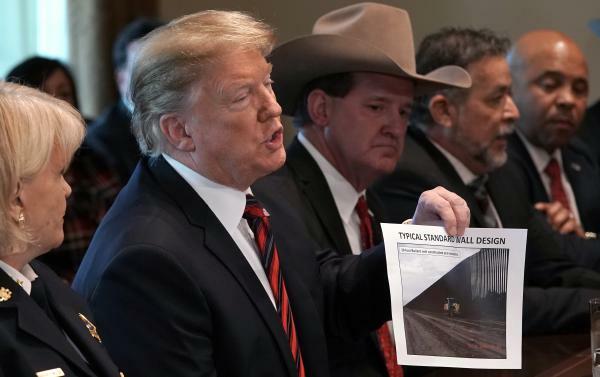 President Trump holds a picture labeled "typical standard wall design" as he hosts a roundtable discussion on border security in the Cabinet Room of the White House on Friday. Congressional and Pentagon sources tell NPR that the Army Corps of Engineers has been asked to identify projects that could be canceled or delayed so those funds could be repurposed for a border barrier. Projects under scrutiny include military construction and civil engineering works designed to prevent damage from future disasters. President Trump has threatened to declare a national emergency if he is unable to make a deal with Democratic lawmakers to fund his border wall, though on Friday he said he was not going to do it "so fast because this is something Congress should do." An emergency declaration could activate special powers under which the president can redirect federal money without additional authorization from Congress. Some see an emergency declaration as a face-saving way out of the spending stalemate that has shuttered parts of the federal government for the last three weeks. "Mr. President, declare a national emergency now. Build a wall now," Sen. Lindsey Graham, R-S.C., said in a statement on Friday after meeting with Trump. On Thursday, Graham tweeted of the emergency powers, "I hope it works." Tapping emergency powers to short-circuit a political fight would almost certainly invite a legal challenge. And Trump repeated Friday that he was not inclined to take that step immediately. But with talks at a standstill over the president's demand for $5.7 billion in border wall funding and 800,000 federal workers missing a paycheck Friday, the White House is clearly exploring the possibility. According to a Democratic congressional aide, money that might be redirected includes funds for flood control and disaster prevention that was appropriated in February of 2018, as well as the Army Corps' current budget for energy and water projects. Raiding those funds for the border wall would likely draw opposition from lawmakers who are counting on Army Corps projects in their home districts, as well as those who are concerned about losing control of the purse strings. "It's a spectacularly bad idea, a complete waste of money," said Rep. Adam Smith, D-Wash. "The only emergency we have on the border right now is people seeking asylum. And people seeing asylum are not trying to sneak in. They're turning themselves in and asking for a hearing." House Speaker Nancy Pelosi, D-Calif., dodged questions on Friday about an emergency declaration and the administration potentially using Army Corps money to pay for the wall. "When the president acts, we will respond to whatever he does," she said. Trump continues to argue that a wall is desperately needed. On Friday, the president hosted a roundtable discussion with state, local, and community leaders to call attention to what he describes as a humanitarian and national security crisis. A new NPR/Ipsos poll finds the president's Oval Office speech on the subject earlier in the week had little effect on public opinion. Only 38 percent of those surveyed were convinced there's a crisis on the border, and ever fewer were persuaded of the need for a border wall. Illegal border crossings were actually lower last year than in 2014 and 2016. But there has been an uptick in recent months. NPR congressional editor Deirdre Walsh contributed to this report.